Pineapple Extract Tea is a delicious yet comprehensive blend of pineapple 12:1 extract, Gree n Tea, Garcinia cambogia and Senna leaf, pineapple tea has been revered for centuries as a natural digestive aid. Pineapple Extract Tea with Garcinia Cambogia is designed to improve digestion and cleanse the body naturally. We only use the finest quality fruit and herb extracts. These herbs are selected for their ability to assist in the digestion and cleansing of the body naturally. 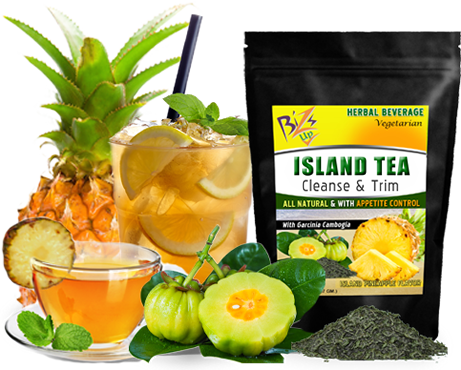 One to two cup of island tea Pineapple cleans & trim tea per day helps aid in digestion, cleansing, and appetite control. Thus, assisting in the prevention of weight gain the elimination of body toxins. Steep one tea bag for five to seven minutes in hot water. Drink hot or cold, preferably after a meal once or twice daily. Note: Pregnant or lactating women, anyone under the age of 18, or persons taking medication should consult a physician before beginning nay weight loss program.